This isn’t the first trade request that the Capitals have reportedly gotten. The first one came on November 25th from Czech forward Martin Erat. It was understandable at the time as Erat went from first line minutes in Nashville to being the babysitter of Tom Wilson & Michael Latta. News of a trade request broke when Russian Machine Never Breaks caught wind of a Czech interview by Erat. “I want to get out of here as soon as possible” is what Erat said in his native language as reported. Now Erat’s situation has somewhat improved. Since Brooks Laich’s injury, Erat has been playing on the third-line with Jason Chimera and Joel Ward. Even though he is playing more, Erat is reportedly still being shopped around. He won’t return a first round pick, which is what was given up for him less than a year ago, but if he continues to play well his stock will rise. Two days later, November 27th, Dmitry Orlov reportedly asked to be traded. Again it seemed to be fitting, Orlov was called up and sent down about 190431878526 times, scratched every time he was in the NHL. Little did we know, until Washington Post’s Katie Carrera that the Capitals were satisfying an escape clause in Orlov’s contract that would allow him to leave for the KHL if he didn’t spend a month on the NHL payroll. Three days after his request, Orlov was placed in the Capitals lineup and has not left. Now, It is reported that Orlov is happy with his situation now (phew!) and has since modified his agent’s trade “demand.” Dmitry will prove that he fits in the Capitals top 4, especially with the season that Mike Green is having and the weak third pair. Orlov has yet to play a full NHL season, and under head coach Adam Oates, Orlov has played very little before the request. December 29th, Michael Neuvirth has reportedly asked for a “fresh start”. Neuvirth’s situation is truly a shame, he was injured by stepping on a puck in warm up before he was slated to start. This forced the Capitals to call up Hershey goalie Philipp Grubauer who has been, well, just short of spectacular. But this seems to be the trend for the Capitals, goalie goes down whether it be injury or a bad run and next goalie up becomes “the guys”. Semyon Varlamov did it when Jose Theodore had a bad playoff game. Braden Holtby replaced injured Neuvirth and Tomas Vokoun in the 2011 playoff earning his starting role. Now it seems to be Grubauer stealing the back up role from Neuvirth or maybe even Holtby’s starting role. The Capitals have a few options now, try to convince Erat and Neurvirth to stay, Trade the two separately, or make them a package deal. Personally I believe the latter is the best option. The declining star and up and coming goalie could attract a solid second line forward or even a top 4 defender. Both of which are something that the Capitals could use. 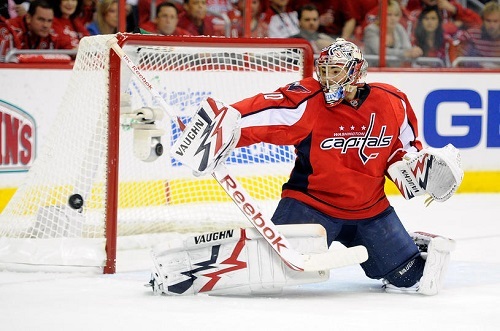 Perhaps the Capitals could land a veteran goaltender, someone like Ryan Miller. Miller is in the last year of his 5 year deal and hasn’t expressed his interest in resigning. The Sabres already traded away 2014 FA to be Tomas Vanek before he could leave in free agency. A interesting trade offer for the Capitals would be Martin Erat, and Michael Neurvirth (maybe a 2015 1st round pick) for Ryan Miller (it should be noted that per capgeek.com Ryan Miller can name 8 teams he can’t be traded to) and forward Linus Omark or defenseman Mark Pysyk . Using Armchair Gm you can see if both teams have the cap space to making a trade, call up players, and ect. Miller would be a perfect fit in Washington, he could help the team to their first ever Stanley Cup. With Miller’s ability to steal games and the Capitals ability to score goals the team could vastly improve. Linus Omark could improve the Capitals’ forwards. The Capitals could promote Troy Brouwer to the first line with Alex Ovechkin and Nick Backstrom. Brouwer would bring another scoring threat the the line and a solid defensive presence. Mikhail Grabovski could then center the second line with Omark at left wing and Marcus Johansson at right wing (That would be until Brooks Laich returns to the line up). The line would bring exciting speed and the potential to score a lot of goals. Eric Fehr would drop to the third line and center wingers Jason Chimera and Joel Ward, taking Erat’s old place. Or if they went the other way and wound up with Mark Pysyk they could pair him with John Erskine and solidify their third defense pair. Pysyk models his play on Shea Weber, a spectacular two-way defenseman. Pysyk would bring a scoring threat from the third pair but also bring a solid defensive presence as well. While all of this is speculation of course, a boy a man can dream.